How our bodies and minds react to stress may be the most important predictor of our health, happiness, success, longevity, and even intelligence. So much research on stress response has been conducted over the past few decades that we now know not only the physiological mechanisms and consequences of stress responses, but also the tools and practices that overcome negative stress effects. Importantly, feeling stress is not a bad thing. In fact, at the right levels, stress is good and helpful. The following inverted U-curve shows that optimal performance requires a medium level of stress. Too little or too much stress reduces our performance. 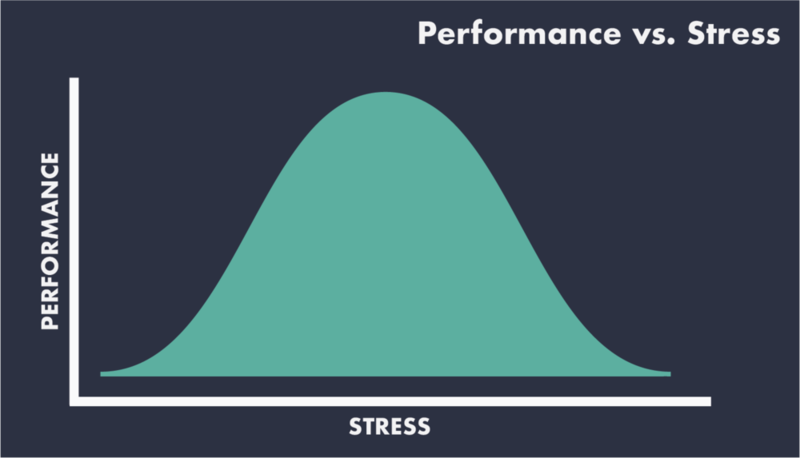 While it is important to elevate your stress level enough to get to the top of the curve shown to the left, most complaints, as well as physical, psychological, and social symptoms, relate to feeling too much stress and falling on the right side of the curve. Research has established that when our stress response is excessive, we become counterproductive. For example, we get caught in a loop of trying things that don’t work or temporarily lose the ability to effectively strategize to get to the optimal solution. This is because excessive stress raises levels of norepinephrine (adrenaline) in the part of the brain responsible for balancing and guiding decisions (the anterior cingulate cortex), which in turn inhibits the mental ability to strategize. Worse yet, too much stress for too long generates an allostatic load that can lead to depression, retarded brain development, inhibition of learning, and severe illness or death. High achievers are particularly prone to high allostatic load and therefore disproportionately benefit from coaching support. Keys to managing our responses to stress primarily include developing habits related to: mindfulness; physical techniques (such as breathing or body exercises) to reverse the biological stress response; mind-body exercises, such as meditation and self-hypnosis; better time management; enhanced willpower; inhabiting the gap between stimulus and response; and enhancing your emotional skills. “Work-life balance” is NOT the answer. Partners in Thought® support is based on the assumption that “work” is part of “life” and that, in every moment of the day, at home or office, it is worth experiencing happiness and fulfillment.